An online campaign has launched to buy sailor Julian Mustoe a new yacht to replace one that sunk in North Sea. 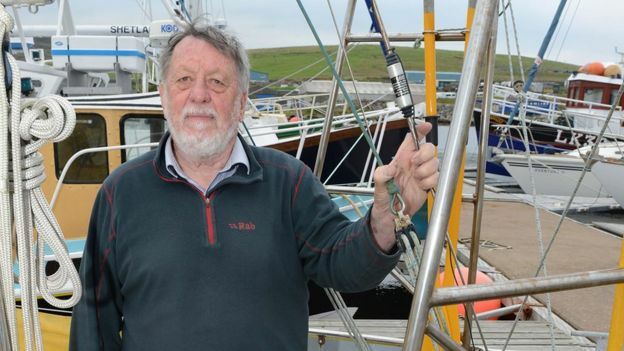 Last week, former round-the-world sailor Mr Mustoe ran into some trouble when his yacht, Harrier of Down, lost steering in the North Sea and narrowly missed a gas and oil platform. Mr Mustoe initially refused to leave the yacht, which was also his home, as he didn’t want it to be left abandoned. After eventually being persuaded to get on board a Norwegian coastguard cutter, the boat was being towed to Bergen in Norway when it sank in the North Sea. Now, an appeal is being made to the yachting community and the wider general public seeking a total of £25,000 to help Mustoe – at the time of writing, the campaign had raised £1,790 with 27 days remaining of the appeal period. Sue Heaser, one of those responsible for the appeal, said: “The Harrier has been Julian’s home and life for the past 15 years. His remarkable book The Voyage of the Harrier about his world voyage in the wake of Darwin’s Beagle has received critical acclaim and is available on Amazon worldwide. Mustoe had been heading for the Baltic when a huge wave smashed Harrier of Down’s rudder. Unable to steer, the sailor was heading for Total’s Alwyn North oil and gas platform when at 8.50pm on Tuesday night (06 October), the crew of an offshore supply vessel spotted the drifting yacht and raised the alarm. In his first interview since the sinking, Mustoe told Norwegian broadcaster NRK that Harrier of Down had been his home for 10 years. He said: “I saw the bow of the ship with the line on it, sinking beneath the waves. When asked what he had lost, Mustoe said: “Everything, all my books, my clothing, mobile, laptop, computer, it has all gone to the bottom. With the benefit of hindsight, I think I should have stayed on Harrier, but the people there wouldn’t take the risk. They said I had to come onto the ship. The Maritime and Coastguard Agency has confirmed that its enforcement division “is investigating the matter”. Contributions can be made to the fund at crowdfunding.justgiving.com/harrierappeal. An RNLI boat in Fowey, Cornwall rescued a crew in trouble - for the second time in a week. RNLI Wells Lifeboat successfully rescued four people after their fishing boat suffered engine failure off Burnham harbour.